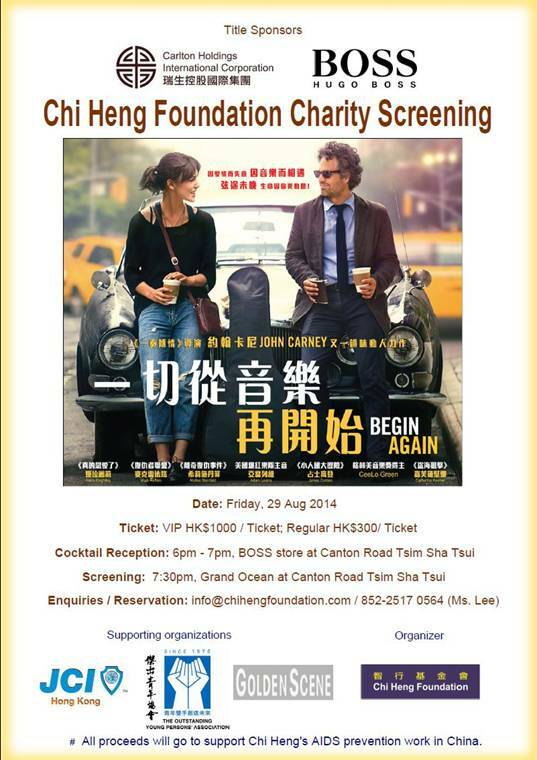 Chi Heng Foundation's Charity Screening Of "Begin Again"
Help support children affected by AIDS in Central China at this film screening in Hong Kong. Hong Kong, August 19, 2014 /ChinaNewswire.com/ - "Chi Heng" means "wisdom in action", and at Chi Heng Foundation wants film enthusiasts to take wise action on August 29, 2014, in Hong Kong to attend the Hollywood film screening of "Begin Again" in Hong Kong. This is a soul-stirring comedy film about what happens when lost souls meet and make beautiful music together. Starring Keira Knightley, Mark Ruffalo, Adam Levine and James Corden, the movie attendance VIP tickets are HK$1000 per person and regular tickets are HK$300. Why attend the film screening? Help support CHF! CHF primarily focuses on paying for children’s education and living expenses, making sure all funds are delivered directly to schools and programs by its staff. CHF does not operate orphanages or foster homes. Instead, local relatives often take in the children, allowing them to continue to grow up in their native villages. To further decrease their sense of social stigma and isolation, CHF places the children in schools that purposefully integrate the orphans with children not affected by HIV/AIDS. These efforts aim to give orphans a stronger sense of community and belonging. Tickets also get you into the Cocktail Reception from 6pm – 7pm at the BOSS store on Canton Road in Tsim Sha Tsui, followed by the screening at 7:30pm at Grand Ocean on Canton Road. For enquiries and reservations, please contact Ms. Lee at info@chihengfoundation.com or +852-2517 0564.